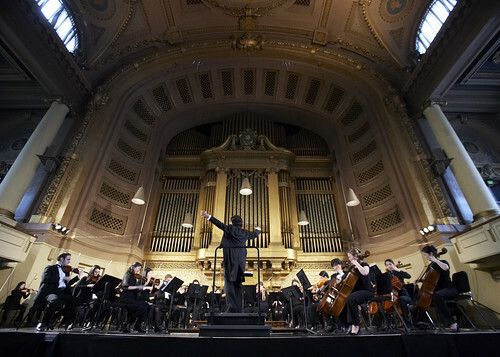 The Yale School of Music presents the annual New Music for Orchestra concert on Thursday, December 6, 2012. The program features the music of five up-and-coming composers performed by the Yale Philharmonia, conducted by Shinik Hahm. The concert presents five new pieces for chamber orchestra: “Guess That Shape” by Stephen Feigenbaum; “Arion” by William Gardiner; “Sinfonia after Vivaldi’s Le Quattro Stagioni” by Michael Gilbertson; “My Reflection Ran Away with my Eyes” by Daniel Schlosberg; and “Sudamala” by Matthew Welch. All five composers are students in the composition program at the Yale School of Music. Other featured students are conducting fellows Paolo Bortolameolli and Jonathan Brandani, who will each conduct a piece on the program. The concert begins at 8 pm in Woolsey Hall, located at 500 College Street. Admission is free, and no tickets are required. For more information, call the Yale School of Music concert office at 203 432-4158 or visit music.yale.edu. Stephen Feigenbaum is an award-winning 23-year-old composer of music for the concert hall and the theater. When he was 19, his Serenade for Strings was recorded by the Cincinnati Pops under Erich Kunzel and released on a CD by Telarc. Stephen is a past winner of the ASCAP Morton Gould Young Composer award and the Left Coast Chamber Ensemble Competition. Recently he won the Albany Symphony Orchestra’s Composer to Center Stage competition, which resulted in a reading of his work and mentoring by John Corigliano. The NPR show From the Top has featured Stephen as a composer, and he has appeared as an a cappella singer on The Martha Stewart Show and NBC’s The Sing-Off. At Yale, Stephen has created several theatrical productions that incorporate all-original instrumental music, stage lighting, elaborate sets, and media effects, tied together with loose narratives to tell musical stories. He has also written the music for two full-length original musicals at Yale. Stephen majored in music at Yale College and is pursuing a master’s degree at the Yale School of Music. He is a student of Ezra Laderman, and has studied with Martin Bresnick, Christopher Theofanidis, Samuel Adler, Claude Baker, and Kathryn Alexander. William Gardiner is the product of a diverse musical pedigree. His teenage years were accompanied by the revelation of rock music, leading to Gardiner taking up the drum set. Later, his interest in composing was provoked by hearing in concert the music of composers such as Astor Piazzolla, Pēteris Vasks, George Crumb, and Alfred Schnittke. Gardiner’s first compositional efforts, works written in imitation of Bach and Piazzolla, received perfect scores in the matriculation exams, resulting in performance at the Sydney Opera House. More recently, Gardiner’s work has taken on the influence of innovative contemporary rock groups such as Animal Collective, the seething, virtuosic compositions of Italy’s Fausto Romitelli, and the meticulous electronic soundscapes of countryman Ben Frost. His work has been credited as “absolutely stunning…a bright beacon of things to come” (Adam Mills, Mess+Noise magazine) and as having “a strong sense of grand sonic movement” (Adam Elmer, Cyclic Defrost magazine). Born in 1987, William Gardiner received degrees in Arts and Law from the University of Sydney. He took courses in composition with several of Australia’s leading composers, including Matthew Hindson, Paul Stanhope, Anne Boyd, Michael Smetanin and Damien Ricketson. Michael Gilbertson is a native of Dubuque, Iowa, and studied composition with Samuel Adler, John Corigliano, and Christopher Rouse at The Juilliard School. Gilbertson’s works have been programmed by ensembles including The Juilliard Orchestra, the San Francisco Chamber Orchestra, the Grand Rapids Symphony, the Symphony in C, the Cedar Rapids Symphony, the Dubuque Symphony, the Flint Symphony, the Rockford Symphony, the Waterloo-Cedar Falls Symphony, the Galesburg Symphony, the Denver Young Artists Orchestra, Musica Sacra, and Aspen Contemporary Ensemble. Gilbertson’s music has earned wide recognition, receiving three Morton Gould Awards from ASCAP, a Charles Ives Scholarship from the American Academy of Arts and Letters, the 2007-08 Palmer-Dixon Prize (awarded by the Juilliard composition faculty for the “most outstanding” work composed by a student during the year), and the 2010 Israel Prize from the Society for New Music. His music can be heard in the 2006 documentary Rehearsing a Dream, which was nominated for an Academy Award. Daniel Schlosberg (b. 1987) is currently pursuing his master’s degree in composition at Yale University, where he has studied with Martin Bresnick, Aaron Kernis, and Christopher Theofanidis, and piano with Hung-Kuan Chen, Peter Frankl, Wei-Yi Yang, and Melvin Chen. He has written works for the Aspen Contemporary Ensemble, New Morse Code, Encompass New Opera Theater, and counter)induction. Recently, the Buffalo Philharmonic read his piece Five Stuck as part of the American Composers Orchestra’s EarShot series. Basement Hades: Songs of the Underworld, an innovative music-theater work for which he wrote original music, premiered at the Yale Cabaret last March and was revamped for the Norfolk Music Festival in July. Daniel performs regularly and remains dedicated to playing works of his contemporaries. Daniel has played Barber’s Piano Concerto and Scriabin’s Prometheus with the Yale Symphony Orchestra, and will be performing Gershwin’s Rhapsody in Blue as a guest artist on their tour to Brazil in May. He recently made his screen debut as a pianist in the film Malorie’s Final Score. Regarded as “a composer possessed of both rich imagination and the skill to bring his fancies to life” by Time Out New York, composer and bagpipe virtuoso Matthew Welch (b. 1976) holds two degrees in music composition: a BFA from Simon Fraser University (1999) and an MA from Wesleyan University (2001). He has studied with noted composers such as Barry Truax, Rodney Sharman, Alvin Lucier, and Anthony Braxton. He has worked with a host of other artists such as John Zorn, Julia Wolfe, Zeena Parkins, and Ikue Mori. The eclectic breadth of his interests in Scottish bagpipe music, Balinese gamelan, minimalism, improvisation, and rock converge in compositional amalgams ranging from traditional-like bagpipe tunes to electronic pieces, improvisation strategies and fully notated works for solo instruments, chamber ensembles, orchestra and non-western instruments. Since 2002, Mr. Welch has been running and composing for his own eclectic ensemble, Blarvuster, whose repertoire the New York Times has hailed as “border-busting music; original and catchy.” Mr. Welch has recorded for the Tzadik, Mode, Cantaloupe, Leo, Porter, Muud, Avian, Newsonic and Parallactic record labels.